The Golden Nugget Las Vegas is a luxury hotel and casino located on the Fremont Street Experience. It is the largest casino in the downtown area and was originally built in 1946, making it one of the oldest casinos in the city. The Golden Nugget is home to The Hand of Faith ; the biggest golden nugget in existence (61 pounds), the second-biggest ever discovered, and the biggest ever found with a metal detector. The Hand of Faith is located next to the VIP check in. The penny machine is on the ground floor in front of the Essentials south gift shop around the corner to the right of the Starbucks in the Carson Tower when you enter off of 1st street. The machine is accessible 24 hours. The Carson Tower is directly across 1st street from the Golden Nugget parking garage. There are two Starbucks inside the Golden Nugget. This is not the Starbucks in the Golden Nugget located directly off of Fremont Street. Las Vegas Penny Collector books are no longer available in the gift shop. 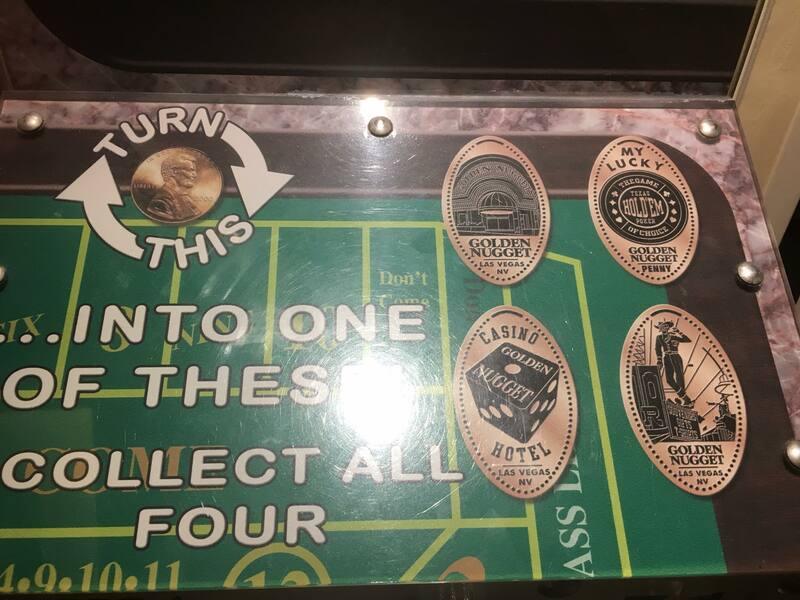 There are three other penny machines within easy walking distance on Fremont Street and one at the Mob Museum: see the Downtown Las Vegas locations. Free parking downtown is now gone unless you are a registered guest at one of the hotels. The hotel casino parking garages charge different rates for hourly parking, most are $2.00 for an hour. You can also park on-street (not on Fremont Street) at one of the pay meters. 1. (V) The front facade/entrance with Las Vegas NV . 2. (V) Vegas Vic under the Fremont Street Experience canopy with Las Vegas NV . 3. (V) A single die with Casino Hotel Las Vegas, NV . 4. (V) The game of choice Texas Hold em Poker chip with My Lucky Penny . thegillion added Golden Nugget Las Vegas Hotel & Casino to system.